One of the key issues in the stock market revolves around the idea of valuations. 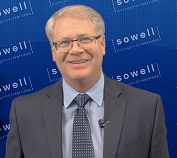 Cutting to the chase, the question is whether or not the growth rate of the economy and, in turn, earnings, is strong enough to justify what most see as lofty valuation levels in stocks. One of the key lessons I've learned in my 30+ years of managing other people's money for a living is this: "Stock market valuations don't matter until they do. But then they matter a lot." So, the real question of the day is if valuations matter here. The bulls argue that the combination of the current low level of interest rates, slow-but-steady economic growth, and the anticipated economic bump from tax reform means valuations are not a problem. The bears counter with a host of rebuttals including the fact that traditional valuation metrics such as P/E, P/D, P/B, etc. are currently sky high and that even Janet Yellen and Stanley Fischer have publicly voiced their concerns about the valuation levels. So, this morning I'd like to offer up a host of valuation charts, so that you can form your own opinion on the matter. Let's start with the Price-to-Earnings ratios. Below are three different versions of the venerable valuation metric. First up is the P/E using GAAP (Generally Accepted Accounting Principles) earnings. Given the degree of "financial engineering" that companies do - including the game of excluding so-called "one-time" expenses that tend to reoccur on a consistent basis - I deem the use of GAAP methods as the only "legit" way to look at the P/E ratio these days. My first takeaway from this chart is there appears to be two "eras" involved. I've illustrated this by drawing boxes around the distinctly different periods. As you can see, in the first "era" the GAAP P/E stayed in a range between 6.5 and 28. But then the world and the valuation range changed as the two bubbles occurred. The bulls like to look at the last 20 years and say, "See, P/E's aren't as high as they were in 2000 or 2008." Thus, there is no need to worry, right? However, looking back at history, there is really no way to justify the argument that stocks are not at least richly valued at this time from a GAAP P/E perspective. Next is the "Median P/E Ratio," which looks at the median P/E of the stocks in the S&P 500. The idea is to get a look at the P/E of the stocks in the "middle" of the market. A similar message is seen here. Two eras of valuation levels with the current reading about in the middle of the range seen since the mid-1990's. However, when looking at the current level relative to everything since 1965, well, again, it is hard to argue that stocks aren't overvalued to some degree. Finally, let's look at Yale's Robert Shilller's take on the P/E ratio. 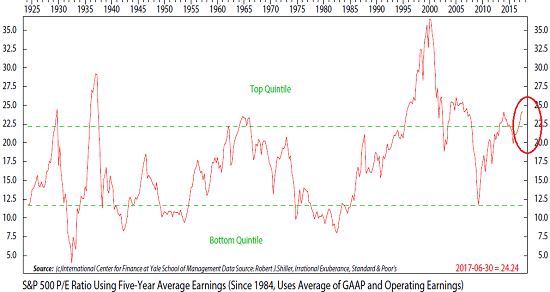 Professor Shiller takes a very long-term view of the issue by employing a rolling 5-year average of P/E ratios. The key here is the reading of this metric is currently in the top quintile of all readings since 1924. Let's now move to other measures of market valuation. Here is the Price-to-Sales ratio going back to 1955. Not sure if there is any additional explanation needed here. While there are any number of games to be played with earnings, the calculation of book value tends to be pretty straightforward. Below is the Price-to-Book Value ratio. My take is here is if one excludes the technology bubble period from 1997 - 2000, this valuation metric is at the high end of the historic range. Hmmm... I think the chart says it all here. Finally, let's change things up and look at an NDR model that compares various valuation metrics relative to the level of interest rates. The first thing to note here is that this chart is "upside down" - i.e. overvalued is in the lower section of the chart and undervalued is the upper section. From my seat, the Central Bank Intervention Era is obvious on this chart as stocks were extremely undervalued relative to interest rates after the crisis and extending into 2013. However, since then, this valuation model has been trending lower. And while stocks are NOT overvalued using this approach, nor are the cheap. In summary, I conclude that stocks are overvalued when viewed through a traditional valuation lens. As such, I have no choice but to conclude that risk factors are elevated. In short, when/if valuations "matter" due to some bearish catalyst, the mean reversion potential is worth noting.